Maritime Rowing is home to the Maritime Advanced Team, New Canaan High School Crew, MRC Middle School Crew, and the Maritime Rowing Club Team. The junior rowing program is organized into the Fall, Winter, Spring and Summer. Adult Learn-to-Row begins in Spring and is ongoing through the Fall season. All seasons include training and racing. Winter training runs from end of October to February, at the Maritime Rowing Club fitness center and at the Yale University Indoor rowing tanks. Indoor training includes cardiovascular conditioning, weight/strength training, and rowing technique on the erg. Some rowers compete in indoor competitions such as the Connecticut Indoor Championships. During the February school vacation, junior rowers and masters can sign up for a week-long training vacation in Florida. Registration for all 2015-2016 winter programs is now open. In spring, rowers move back to training on the water. 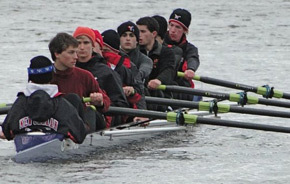 High school, Middle School rowers compete in select sprint races and regattas, including the annual St. Lukes’ Invitational regatta, the Greenwich Invitational, Mercer Lake Sprints, Cooper Cup, Northeast Regionals and US Rowing’s Youth National Championships (for qualifying athletes.) Masters rowers also compete in sprint races, including Derby Sweeps and Sculls and the Mayor’s Cup. A competitive program is available for experienced high school rowers. Pre-season camp — for middle-school and high-school rowers is a one-week transitional session during the last week of August. Maritime Rowing Club offers Fall training and racing programs to high school rowers and middle school rowers of all abilities. The Fall season runs from September through mid-November, and includes several local and regional regattas, including Mystic Coastweeks, Head of the Housatonic, Head of the Schuylkill, Norwalk Row for the Cure, the New Canaan Invitational, and the Bill Braxton. Fall programs are available to both Middle School and High School rowers. Find out more about our rowing programs… and register now!